Author Archives: Baba Tony or Baba "T"
About Baba Tony or Baba "T"
To begin, thanks to Awo Falokun for the invitation to share in this needed process of upgrading our understanding of Ifa messages. I was strongly guided to keep it clear. direct and simple — but it is not easy. We all need to work! So. let’s savor the message like a well decorated plate of flavorful food. The following are select verses to savor +!reflect upon. Recommended: read verses over and over and over….. reflect…… and reflect some more…..!! When you start to sync up with the wisdom……rejoice! In closing, when you start to sync up with the wisdom……and feel it…….rejoice! This entry was posted in Blog on May 3, 2018 by Baba Tony or Baba "T". To begin, thanks to Awo Falokun for the invitation to share on his Facebook page on this needed process. “It” is a work in progress. “It” has prompted this resultant work. And the work is for humanity. Sober reflection on the myriad disappointments in this current phase of the human condition in this contemporary society – local and global. Digitally drenched in newsfeeds – fake and “actual – and sitting in quiet desperation is morally / ethically and viscerally unacceptable. Following the “prompt” to share some “messages” from the ALMIGHTY via Ifa — “Osa Eleye (Osa Meji) was revealed on Ifa Prayer day – the 17th day of April 2018. These messages from Osa Eleye is for us – humans — on Mother Earth to pay close attention….AND….act individually then collectively on more than a “handful” of items on an important “to do” list. It marks “revolution”. Personal and societal. Contemplate and respect robust, fomenting and resilient Feminine Power in all forms: Human / “Non-Humans” / Corporal / Non-Corporal. Sober contemplation, reflection, and deference to this significant attribute of this odu. Pay close attention to human representations of strong, resilient Feminine Power in our current society – locally and globally. Vandana Shiva – Indian scholar, environmental activist, food sovereignty advocate, and alter-globalization author. Add to this list and post. Follow their work and take notes. Men – we need to pay attention. Consciousness / consciencia: We all need to upgrade awareness of “cycles.” We are living through a powerful one with these “phases” that are unprecedented for many of us. And sobering. Even gut wrenching — on many levels with plenty of examples. Make a list of the current affairs of humans that rock you to your core. What are you / we going to do? o Post hurricane, Maria Puerto Rico and the loss of my elder first cousin. She was started a new chapter in her life of retirement after giving a life of service AND surviving the South Bronx for 74 years. Tough as nails. “Maria” prompted her transition. Post- Maria PR is prompting many “transitions”. o Unresolved and brewing contention with North Korea. My late father returned from the Korean “war” sixty five years ago with severe PTSD. PTSD in 1953? The condition was “unknown” and “unnamable”. Who had compassion for him, us and the thousands returning vets back then? What did he “fight” for? So, this current contentious narrative of North Korea is more than sobering. With this odu, Ifa is prompting us as humans. We have to de better. What is on the “agenda” for the next “phase” in this cycle we’re living in? How are we doing with that? Preparing? For what? Truth / La Verdad = Otito in Yoruba. You / We need to face “truth.” We need to be truthful. Be prepared for bitter along with sweet. We need to study “truth” like a new software app we’re excited to use daily. Ifa says in this odu: Take a deep, clear-headed, honest self-reflection of one’s own life. In-depth “look “in the mirror”. We need to make this relevant as we observe ourselves and this society “morphing”. Into what? Where do you / we fit into this transition? Reflect on the myriad of examples. The pros and cons. What’s working / not working? Your / our reflection should reveal a truth/truths that should open the way towards a “freedom” after “it” gets you/us “upset” / moved out of our comfort zone. Who governs “opening the way? We need to be grounded / prepared to be continuously provoked by this principal of “instigation.” This odu is a “puja” / goad and it prompts. Reflect on all sources of inputs — especial mass media and social media. How is this information / mis-information / dis-information “sitting” with us? Is it confusing us or helping us us to discern the truth? We all need to seek truth. In this odu, Ifa says to us humans — to modify ourselves, we are prodded — as in being provoked — on many levels. Reflect on this and make a list. Make those provocations positive as in a stimulus for positive action. An honest observation of human society — we all are being prompted to make changes. Resist, and we lose. o “Nje awa oju o? Where are the eyes? We now possess time to see our lives……for what it really is. o “Aye, nwoju omo re kiri awa roju asi ri Aye”: Mother Earth is looking for “the “face/eyes” of her own children. o who are “we” to Mother Earth? What is our actual relationship with Her? o She wants to know……. Given the intensity of the current phase in this cycle, “Mama / Iya” — in all her manifestations — is giving an assertive if not aggressive push towards developing good character. This is a test……….. How are we doing? We all want “Ire Aje” / Blessings from “Wealth”. We are prompted to develop individual / collective wealth through a time tested formula: self-knowledge > self-development > personal wealth. “Outer” and “material” wealth should follow. Worthy of serious reflection: Sango was victorious in winning a “cold war” based on his preparedness. Contemplate this odu as principals of Ifa, Obatala, and Sango for personal and collective “success.” One simple example: Use White Cloth / Avoid using red cloth. Avoid peanuts and associated products. Reflect on why many have allergic reaction to peanuts as an immune response. Avoid consuming / over-consumption of our “feathered relations of the Bird Nations” and their products like eggs. WE are prompted to ask: Why do we humans consume millions upon millions of birds anyway? Are they the best source of nutrition? Are they slaughtered in the millions in a respectful manner? What is our relationship to the “bird nations? Ifa advises to be faithful in relationships. Have we have witnessed enough betrayal and treachery? Individually and collectively? When is “this” going to diminish? We are advised to be mindful of our intentions and resultant power of enunciation. Simply, don’t “curse” anyone or any “thing”. We all want to avoid contribution to negative karmic cycles that seem endless. It is clear that the opportunities to create an upgrade to our human society are upon us. We all have to contribute bit by bit / poner de nuestra parte….grano a grano. Many of us may be motivated by utopian / democratic / egalitarian ideals that may reflect our strong spiritual values. We live in highly politicized cultures. What does Mother Earth want us to do? To conclude, this is an ongoing process. This entry was posted in Blog, Empowerment, Ifa on April 24, 2018 by Baba Tony or Baba "T". The Interfaith Center of New York (ICNY) is happy to co-sponsor a special Ifá prayer service on International Peace Day. There will be refreshments and an opportunity for socialization (1-2 pm) after the prayer service. A flyer for this event is available here. This entry was posted in Blog on September 9, 2017 by Baba Tony or Baba "T". Cosa Nuestra celebrated Latin music and culture at La Factoria (The Factory), one of Greenpoint Brooklyn’s newest venues. The event was billed as “Pa La Ciudad!” (For the City) and it was hosted by the renowned “new gen,” Nuyorican poet and actor, Flaco Navaja, who guided the crowd through a transcultural history of El Tambor aka the drum – from Africa to Latin America and New York City. The festivities featured crescendo building performances by ÊMINA, an all-female Latin Pop group with a Salsa tinge, ÌFÉ, ILU AYE (Drum of the World) a consummate Afro-Latino collaboration of young multi-talented percussionists, Pedro Adorno Irizarry and Cosa Nuestra’s “Salsa Dura” Conjunto led by Hommy Rivera. Also, a rich selection of tracks dosed with hearty “old school” salsa by DJ Christian Martire (Sociedad Records). At La Factoria, the mood and the atmosphere was festive and the crowd – an eclectic mix of hipsters, island Puerto Ricans, Latin Americans, Nuyoricans, Pan Latinos and a sprinkling of Baby Boomers – were intent on an intergenerational celebration. As xenophobic, anti-immigration politics and Puerto Rico’s crises sober us up, Cosa Nuestra seeks to use art, culture, and cuisine to bring Latino ethos to life and heal and transform the conversation around Latinidad. Proof of this event was the curative power of our Afro-Caribbean rhythms – celebrating Afro-Latinos! The personal magnet for this review was ÌFÉ. Their performance was a mind/heart sojourn of inter-dimensional quality with a “Ęlégbá” mindset (Divinity foremost in opening Pathways to Consciousness). Digitally enhanced melodies and rhythm synced with 2/3 clave on top of six-part electro-bata rhythmic conversations emulate primordial language subconsciously understood by humans and “grokked” logically by Orisa (Deities). The music moves you on multiple levels. Further, overlays of continuous flavorful “repicando” (percussive riffing) embellish these conversations. The result? Joy and waves of Euphoria! ÌFÉ: created by “Awo Ni Orunmila” (Ifá Preist) Otura Mun aka Mark Underwood, was created in Puerto Rico – our endeared enchanted island (Querida Isla del Encanto) with idiosyncrasies so unique, even Brazilian Percussionist Airto Moreira said, “Latino: Aqui Se Puede” (1986, Montuno) – “Here. One is able,” when he recorded in Puerto Rico with island based musicians. ÌFÉ’s approach to Afro-Latino history is encoded and layered with highly nuanced creativity from multi-lingua-cultural reference points. Honey-like Al Capella “coro” (choruses) call and response vocal “hooks” that uplift and tasteful “Quintiando con Sabor” (intelligent and flavorful percussive conversations) thus encouraging close listening and reflective savoring. Behind the scenes, the paternal mentor is veteran Akpon Ol’ Obàtálá Emilio Baretto (Master Devotional Singer to Òrìšà (The Divinities) – Yorùbá Deities – akin to a Jewish Cantor) graciously guiding ÌFÉ’s spirit filled team of musical Sky Walkers with Yoda like acumen. Decades of dedication to the craft of devotional song / cultural understanding of Orisa, is selflessly passed on. With divinely sanctioned “Apoyo Fraternal” (fraternal support) by fellow Awo (Ifá Priest) Èjì Ogbè Rafael Maya and the first class team of dedicated musico-artistes present a formidable priestly presence onstage – which is somewhat unusual in venues of this sort. It was a breath of fresh air, ethereal yet grounded in a renewed approach to tradition. The supporting cast at this event was Anthony Sierra, Beto Torrens and Yarimir Caban where her voice – at modulated devotional invocations to Òrìšà (The Divinities) evoked heartfelt emotions and raised goose bumps. The ascension prepared the audience to ground with ”Come Down (Umbo),” a digital-clave multi-lingual male lead followed by the sweet diva Yarimir Caban. Her vocals – at times digitally modulatated — flow like “guarapo de caña” (extracted sugar cane and syrupy juice) – suggesting a flattering call for Yemaya / Yęmōja (Mother of Children of Fish) descend and heal her children. “YumaVision” – a savvy piece creatively uses unique Cuban colloquial “Yuma” (referring to mainland U.S.A). The multi-contextual delivery indicates a hipness of regional and cultural peculiarities. “Aro” (ritmo electro-bata) for Yemaya / Yęmōja (Mother of Children of Fish): Crescendo building slow to rapid tempos set to blue lighting and white cloth. The tune transports the audience to an oceanic realm in preparation for what is to come. “Prayer for Odùduwà” (Para Merceditas) – The first King of the ancient primordial Yorùbá city of Ile-”Ife” impresses with depth and somber respect as it segues to devotional honor to Obàtálá with “Baba Loroke” (Father of the mountain of wealth). Gently lead by Yarimir Caban. Otura Mun’s heart touches hearts with “House of Love” (Ogbe Yekun”). Sonic-visuals envelop and transport the audience on a voyage via ÌFÉ – House Of Love (Ogbe Yekun – OFFICIAL VIDEO on YouTube provide the link). Dedicated to “Ara Orun” / “Egun” (celestial / terrestrial relations), the piece evokes an intuitive feeling of sky walking. ÌFÉ’s evening excursion closed with “Bangah” (Pico y Palo) with an invitation to liberate the audience from mental and spiritual slavery and is inspired by Puerto Rico’s liberation. From the opening inhale/exhale oxygenating intro to the honoring of warrior Father divinities Ògún (Yorùbá) and Sarabanda (Bantu / Ki-Kongo) this flow invigorates with electro-bata ChaCha Lodafun rhythm, creolized Bozal “Sia! Also, it announces the intentional use of “Nsalo Maleko,” a pre-Islamic creolized retention of ancient Central African greeting of PEACE. Universal then, universal now! 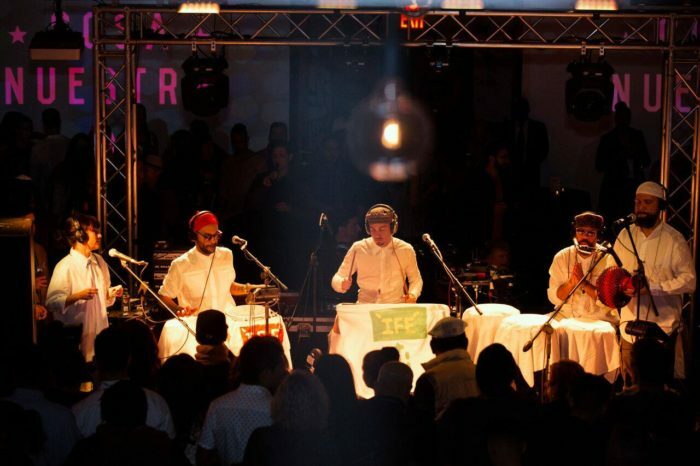 Performed in a festive secular venue, “ÌFÉ” succeeded in delivering a genius, heart touching sequence of sacred songs. A unique spiritual ambiance was created before our eyes and ears – unusual for a raucous nightclub and a healthy and much needed humanitarian message was delivered con Sabor Criollo (creolized flavor). To close, from the outset, ÌFÉ’s stage presence establishes an ethereal yet firmly grounded en clave 2/3 time (meter structured and controlled) and delivers consistent and ageless advice to humanity: cultivate Iwa Pele, Iwa Suuru, Iwa Rere (a character that is gentle, patient, content). Their gentle, soothing sweet water, sonic signature is consistent with the IFÁ principle of developing gentle, patient and soft character as human virtues. And, ÌFÉ surprises when the flow intentionally morphs into a visceral and muscular staccato groove crafted to stimulate and ultimately unshackle the human heart towards Expansion + Love = Liberation. ÌFÉ excels with Ášé / Aché! This entry was posted in Blog on May 19, 2017 by Baba Tony or Baba "T". On March 4, 2017, JAZZ AT LINCOLN CENTER (Frederick P. Rose Hall) presented the second of two performances entitled, EDDIE PALMIERI, CELEBRATING 80 YEARS. The festivities were divided into two segments: Latin jazz aka “instrumental mambos,” and an “Afro-Caribbean dance-set” of Nuyoricanized Salsa Dura (Hard, solid clave with traditional flavor). Palmieri opened with a solo-piece dedicated to his late wife, Iraida and continued in “honoring mode” with loving words about Mama Julia, his paternal grandmother, an enslaved African and the source of the rhythmic patterns that are his “life’s pulse.” Also, warm mention of his late elder brother and master musician (pianist) Charlie Palmieri; JALC’S Artistic Director, Wynton Marsalis and the late Frank “Machito” Grillo, Tito Puente and Thelonious Monk, all iconic figures in his musical matrix. All the musicians deserve honorable mention but a particular tip of the hat goes to Urban Jibaro/Cosmopolitan Guajiro Jimmy Bosch, whose “trombonic” phrasing and solos are invocations for cause for celebration; Bassist Luques Curtis’s intuitive interplay with Maestro EP’s piano work; authentic sonero Herman Olivera’s heartfelt pregones which honored the elders; masterful Tres work by Don Nelson Gonzalez Camilo Molina’s disciplined, classy approach to the timbales and trap-kit indicate inspiration from Ifá (Yorùbá – Lukumi cosmology). In all, there were consistent blasts from the unified brass section; musical warrior angels on trumpets, trombones and saxophones that raised eyebrows as they played in sync with a rock solid rhythm section marinated in signature Palmieri school of “Clave Afincao y Aguanto” (tension and release in 2/3 time, meter structured and controlled). As the late science-fiction author, Robert Heinlein coined, we (the audience) “GROK” (understand something intuitively or by empathy) the full spectrum of Master EP’s musical messages. At the age of 80, Mr. Palmieri continues to “download” the latest solar sourced inspirations, edify his family, ancestral relations, his elders, his band, and the audience, indicating that he understand the formula. Eddie Palmieri “GROKS” and continues to rock. Words of gratitude to Tomas Pena who invited me to take his place in reviewing this performance of my music hero of over a half century – El Maestro Eddie Palmieri. Thanks – Live and prosper, brother! Contained here are links to sample Maestro EP’s work with trimmed down core personnel of JALC’s March 3 + 4 2017 performance. Nothing like live! Enjoy and savor! PHOTOS: Eddie Palmieri, Eddie and Charlie Palmieri by my cousin — Primo! – Joe Conzo Jr.! This entry was posted in Blog, Education, Empowerment, Mental Health, Music, Well-Being on March 11, 2017 by Baba Tony or Baba "T". Reflecting on currents events in the US — pre-Thanksgiving November 2016, both of my eyebrows are raised. There is a lot of work to do to balance human society. A collaborative effort by both ICNY — Interfaith Center of New York and NYPD – New York Police Department. Key word = collaborative..………….. This event – and the larger, ongoing efforts – – was….and still is…..a needed initiatory process in this “balance” we need in our globalizing human society……….here in microcosm in New York City…………. It’s work………… It’s got to be done……..
I’m satisfied to say that ….this is a start………….for many a needed conversations, ……………respectful dialogues and action to contribute to change / balancing several handfuls of issues that will help the human species “download the latest updates” from the heavenly realm..and “ground” that “knowledge, wisdom and understanding” firmly on Mother Earth’s sacred ground. Mother Earth – we are “morphing” into a more improved species………Yes? So, review the articles and reflect on what you / we / us …can do………….. This entry was posted in Blog on November 22, 2016 by Baba Tony or Baba "T". The ideas I share are like seeds of majestic trees. Blown onto asphalt and concrete in urban zones. And then…..some fall into rich fertile earth. I suggest that the seeds I shared be stored in a safe place for future planting. This entry was posted in Blog, Education, Empowerment on October 31, 2016 by Baba Tony or Baba "T". The fall equinox is past …., autumnal cycle is upon us…… Are we encouraged to reflect on change? — upgrading — downsizing — rebuilding those relationships that we perhaps were remiss in maintaining? What is this journey all about? is it Building / rebuilding relationships? Even as the leaves turn bright colors wither and die ….to another birth…..as they fall……to become Mother Earth’s top layer…..
Who is on our top layer of human contact? Ah……Reflect…..it is good to do — present…..in the now ….for — before we realize –it will be about rebirthing — another cycle – in 6 months…. This entry was posted in Blog on October 5, 2016 by Baba Tony or Baba "T".